How to Learn – How to Teach | What Do I Get? What do I get if I buy on-line now? It’s about you and your children—or you if you are a student. Whether you are a home-schooling parent caring for your own children, a teacher caring for the children of others, or a student wanting to do better with your studying and learning — this book is about you. I know how you feel when you see a child suffering, having difficulty with his or her study. As a good and caring parent or teacher it hurts. I know parents often despair at what to do: what help can they give; how can they resolve the problems their child is experiencing that threatens their whole future and causes so much anguish in the present. It is heartbreaking to see a child perplexed, unable to understand what they are told they should be understanding. To see the child suffering self-doubt; destructive self-doubt; soul destroying self-doubt; the kind of self-doubt, and failure to resolve the problem, that destroys lives and causes the abandonment of hope, dreams and aspirations, and the enjoyment of prosperous futures. I have good news for you. That can all be a thing of the past for you and your child! We have the answers to why it is that children have difficulty learning, either at school or in the educative process where ever it takes place. And we have the correct processes and answers you can use that resolve the difficulty kids have in the learning process. And they are available to you now. Here’s what you get when you act now and buy The How to Learn–How to Teach Manual & Training Material. The How to Use This Manual write-up. It is attainable that we learn with full comprehension 100% of what is presented to us and have the ability to masterfully apply all that is learned during our studies. Most importantly, you get the How to Learn–How to Teach Training Course Progress Checklist. This checklist of training steps takes you gently through the precise series of actions and things you need to do to fully learn and master the application of this material. 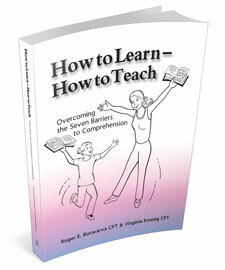 This ensures you get wonderful results with your child or students when you use the knowledge contained in this manual. Guaranteed results! No ifs, buts or questions about it! Normally, when this course is sold alone, it costs $1,000 all by itself, but if you buy How to Learn–How to Teach on-line today, the extra Training Course Worksheet and Progress Checklist is included —FREE as a special bonus to you. And there are no shipping and handling costs or delays! No wrestling with traffic to get to the mall. But what would literacy problems cost you or your child in lost income in their lifetime? What would it cost your child, or you, in lost potential? It’s horrible to contemplate. Literacy problems destroy lives. This is why I am giving you this $1,000 bonus gift FREE, for acting wisely, caringly and promptly. It’s my way of saying I acknowledge your caring and wanting to do the right thing for your child— and for all of our futures that depends on our children. There are eighteen complete procedural rundowns comprising multiple steps and actions, one-hundred and nineteen individual processes and drills, and this all in addition to the numerous tips lists. These are designed to do six things. Remove and eliminate any non-comprehensions and misunderstandings of any areas of study that you or the child or student has already encountered. Clean up and restore the ability to learn, comprehend, understand, and apply what is learned at a masterful level. Strengthen and increase the power of the student’s ability to learn and to withstand the faulty educational practices used in today’s system. Give you, your child or student a subjective and experiential understanding of the truths of the principles and secrets revealed in this manual. Make you the masterful home-schooler or teacher you want to be. To ensure you are not making the mistakes most teachers and home-schooling parents make. There is the Workbook of Exercises. These are the eight exercises comprising twenty-one parts with eighty-seven drill actions that blow your sox off and cause you to really understand what this subject is really all about, its importance and how to apply it. By doing these exercises you’ll really get to experience the power of this material, just as Christopher Calta, Manager, College of Customer Service, JetBlue Airways University did. (Read what Chris said here) Or as Kevin Hanks, a former teacher, School Principal, Schools Superintendent and Director of Human Resources for Southern Westchester County Board of Cooperative Education Services did, (Read what Kevin said here) and Dr. R. Gathoni Maina Ph. D. did (Read what Dr. Maina said here). A Full Subject Index that lists all of the Who’s and What’s and How’s and their location in this manual. Overcoming the Seven Barriers to Comprehension. Clear delineation of what these seven barriers to comprehension are. How to prevent these barriers to comprehension from impeding or blocking your child’s or student’s understanding. How to overcome or eliminate these barriers to comprehension where they have already occurred. The Twelve Vital Fundamentals of Life and Life Processes that can block the ability to study, let alone comprehend what you, your child or student is studying. How to ensure these Twelve Vital Fundamentals of Life and Life Processes are not violated. How to repair these Twelve Vital Fundamentals of Life and Life Processes when they are violated. Wonderful, illuminating stories and examples of how these Seven Barriers to Comprehension and Twelve Vital Fundamentals of Life and Life Processes impact on students and in our lives, and the wonderful results and rewards of knowing and being able to apply this knowledge and be free from them. The secrets of mastering the learning process, and how the masters do it. Isn’t this something you want to do for your child, your students, yourself? Imagine what it will be like being free from these barriers to winning in life, being able to help your children or students win in life without being blocked by these barriers. You need to act on this now, for your own good and peace of mind. Imagine how you will feel, the shame and regret, when, if in the future your child does not succeed in school or in his or her study and thereby had a difficult time in life, if you do not act today and do all you can to help your child succeed. Worse, if you are aware your child is having difficulty, and you do not act today to help undo that difficulty, imagine how you will feel when, later, you see the damage and that it could have been prevented had you acted today! This is your most important duty, to help your child learn, and to do so today! On the other hand, for the cost of the How to Learn–How to Teach Manual& Training Material, and the small amount of time it will take to learn and apply the material in it, you will be able to feel the pride of accomplishment and the joy of seeing your child winning hugely at the learning process and succeeding mightily at school, in studying, and all he or she is engaged in, in life! Imagine the joy of seeing your child winning at everything he or she touches; competent, understanding, confident in himself or herself, and accomplishing all of his or her dreams and aspirations! Read and test our material for 60 days to verify what I’ve said about this book’s value to you. If after carefully reading this manual, doing its exercises and properly applying the materials learned, you honestly, really feel it’s not been worthwhile, write me a letter explaining what you feel didn’t work for you or your child, and I will refund your money in total—no questions asked.